And like everything, it has to be used safely and responsibly. As well as opportunities, there are also risks that we need to be aware of and guard against. As children get older they spend more and more of their waking hours connected to digital devices—impacting their reputations, learning opportunities, and futures. At Foxdell we are committed to giving our pupils the tools to stay safe online. This area is designed to provide pupils with information and links to a variety of different websites to help them understand the benefits and the risks. If you are having issues with online bullying or have a concern about something online that you would like support with, please talk to your class teacher, Mr Kerr, Ms Bliss or Mrs Abbott and we will do what we can to help you. 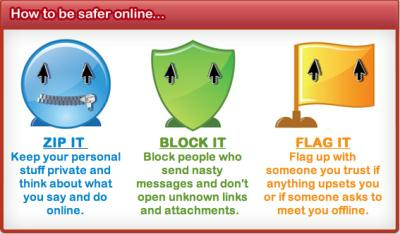 A great site for information on how to stay safe when using a huge range of online resources. A good mix of information, advice and activities to get you thinking about how you can stay safe online. The 'ultimate internet safety survival guide' from CBBC. Bright, colourful and with loads of fun songs and games. An excellent site from CEOP. Sections are age linked so that you can get the advice that is most relevant to you. The people who bring us Safer Internet Day ( next years is on 7th February 2017) have a site with lots of good advice for Primary children.